The following stories and notes were written by Francis Blum, shortly before his death. Francis was a long-time rural Westfield resident. He had been researching Westfield history for many years and had talked to many people in and around Westfield. 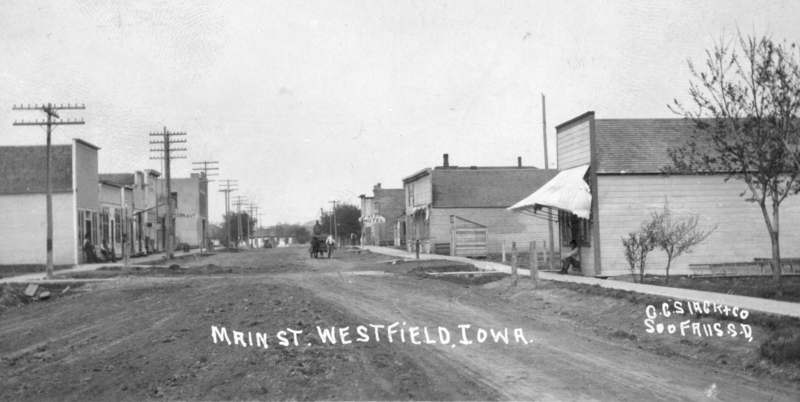 Westfield, as it's name implies is the western-most town in Iowa. It is located on the northern edge of the "Loess Hills" and is the northern boundary of the mulberry tree. The old village of Westfield was platted by the Western Land Company in the year of 1856, it was mostly abandoned during the Indian scare and was replatted in it's present location in August 1877. It is not known exactly where the old Westfield village was located but research has located lots sold by the Western Land Company on the now Paul Bringman farm, north of present Westfield, and this is where the first Westfield was believed to be. Westfield competed with a couple of other towns, namely Melburne, for the location of the county seat, but was to far from the river and railroads and lost out to LeMars. 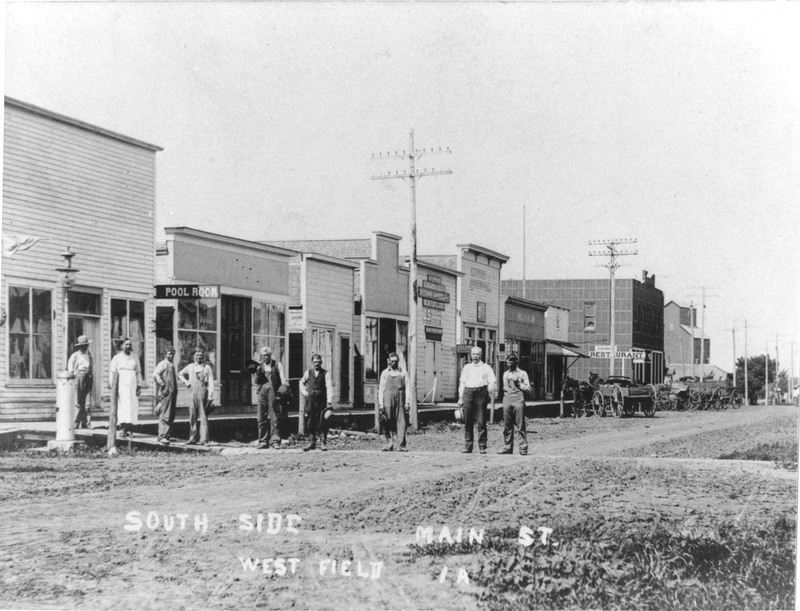 Westfield had a bank (which was robbed), blacksmith, post office, grocery store, barber, hardware store, hotel, elevators, churches and a lumber yard, but lost out to other towns due to it's location and proximity to Sioux City and Akron as ease in transportation increased. Westfield Township: Thomas McGill 1857, John Hipkins 1857, Joseph Gason 1857, Mr. Vidito 1857, I.L. Martin 1864, George Cilley 1879-1880, Rugus Clark 1873, William Foster (year unknown). On May 20, 1862, Congress passed a Homestead Act granting 160 acres of western land to settlers for $1.25 (One Dollar Twenty Five Cents) per acre. The first person to file under this Act was Mahlem Gore just across the river from Westfield Township. Also in that area was a dug out home faced with heavy timber. When I visited there several times in the early 1930's, Bert and Earl Rolfes lived in it. This dugout was later lived in by the Tresslers until about 1970 when they moved into a trailer. Another dugout was on the James Tracy farm. There were mills all up and down the Big Sioux but for our purpose we will consider but two of them. The earliest of them was a grist mill built by Hotchkis & Decter in 1867. No doubt it used stone burrs. This mill was located about 100 to 150 yards down river from what was referred to as the White Bridge. The mill was located on the west bank of the Sioux River. Near the mill was a ferry that was supposedly run by Hunter. On or by 1888, this mill was shut down and sold to Grover Lilly. It was then either dismantled or tore down and the timbers were used to build the barn on the Clair Lilly farm in Section 3 of Sioux Township just south of Westfield Township. This can be seen today. The base of the dam by the White Bridge can be seen today when the river is low. The other mill on the Sioux just west of Westfield was built in 1876 by Crill & J.D. Wood and was called the Centinnial Mill. This mill was thought to have stone burrs. The town of Westfield has two churches. The Congregational Church was built in January 1899, Rev. G.A. McKinley was the first pastor and served about one year. This church is still active today. The Catholic church was built by October 1903. Father F.B. sullivan was it's first pastor. This church was deactivated some 10 years ago. It's parishoners now go either to Sioux City or Akron. The railroad going thru Westfield and Akron north was completed in 1874 & 1875. It was the Chicago, Milwaukee & St. Paul railroad. It crossed the Sioux River below Westfield and joined a road at Elk Point named the Dakota Southern. An attempt to run a road up the east side of the Sioux River came to a halt when grade work was stopped by (Robert or William Hunter). Evidence of this grade could be seen in the 1950's, just below the mouth of the Broken Kettle Creek. Another road was graded from Elk Point and a bridge was laid at the Frank Dennison farm. As near as can be ascertained the road went no further. (The bridge was dismantled and the timbers were used to build the large barn on the Dennison farm.) The piling for this bridge can be seen in the river at this date. Another road was proposed to run from LeMars to Akron or Westfield and then to Yankton. The Illinois Central turned south however and went to Sioux City. Stage lines ran between towns but not much is known about them. There was a stage depot at the Rollo Baker farm that went to Alcester. The lines stayed away from the Big Sioux whenever possible due to the swampy conditions of the Sioux bottoms. Others followed ridge roads, etc. and cut across sections to avoid steep hills. A sand mine was driven into the East bank of the Sioux River in Section 12. It tunneled east under what is now Highway 12. After it was abandoned, it was used as a hog house. the mine was timbered and Iva Knapp told me that he and other kids played in it after it had quit being used for hogs. Some time about 10 years ago the section of the mine under Highway 12 collapsed and the road sand a couple of feet and had to be filled. This mine was used to supply sand for foundations before open pit mines were established. This piece of history was told to me by Herb Johnson whose father was a participant in this venture. A sum of $5,000 was offered to anyone who could find a paying run of coal in Plymouth County. So Herb's father and some others formed a group and decided to sink a shaft in the southwest corner of Section 5 in Johnson Township, just outside of Westfield Township. This shaft was to be one mile west of Ruble. Why they thought they would find coal there I don't know, but they started the shaft. This was some 8 ft. square and when they got down some 20 to 30 feet one of the men digging said "It sounds kind of hollow here" and then he jabbed his spade into the dirt and it almost dropped out of his hand and it sank into the earth. And water started to gush up! The diggers got out of the shaft and they started to figure how to get the water out of their pit. All efforts failed until they rigged an 18 inch casing with a piston and valve at the bottom tied to a large pump rod. They went down the Broken Kettle Creek and cut 3 cottonwood timbers and stand 2 of them up right into the ground with the 3rd one balanced with a large pin in the center with the one end over the shaft and connected to the rod in the casing. The other end was connected to a gear box with a crank arm and was belt driven by a steam engine. This acted as a pump jack. After several tries and corrections they finally got it working. I asked Herb how much water would it pump at each stroke and he said "About a barrel of water per stroke". After getting this pump going they started pumping and after a 4 day and night run of steady pumping they found they were pumping the wells at Chatsworth dry!! So they realized they were pumping a river, so they gave up on that project. The shaft was filled back up with dirt and a fence put around it as it was feared it would cave in. This fence stood for years and finally when Arthur Netley lived there the fence was taken down and the land farmed over. So far as I know it hasn't caved in! I always wondered what the fence was for and finally got Herb Johnson to tell me the story. A bit of Plymouth County History. Very shallow veins of coal were found in the lower Broken Kettle Creek and some settlers used it to heat their homes. But the veins of coal were too thin to pay to mine and it was said the coal was not of the best quality. So much for coal in Plymouth County. One of the most dreaded scourges of the prairie was a prairie fire. In many cases being impossible to put out due to the abundance of grass the only thing to do was to try to out run it. This meant working ones way to the side of the fire as nothing could out run it if there was a wind blowing and the fire created it's own wind. One of the largest and most disastrous fires started in the spring of 1879, the last week of March in the lower end of Union County in the Big Sioux Valley. This fire burned for most of a week, swept north up the Big Sioux Valley to a point some 30 miles north of Sioux Falls. The fire averaged some 20 miles in width and in it's sweep destroyed everything in front of it that could not escape. I have never found out how it was started but it laid bare the whole or most of the Sioux River Valley. A possible offshoot of this fire developed in Section 8 in Johnson Township, a mile west and mostly a mile south of Ruble. It involved the Wallace Fuller farm and Mrs. Fuller who went ot help her husband get the livestock out of the barn was overcome and burned to death. One of the few from this disastrous fire. The year, month and week coincide with the Sioux Valley fire. Canton, SD was threatened but by serious effort was protected. Sioux Falls suffered some loss of buildings. This was the most disastrous fire known in South Dakota in terms of life and property. Westfield township has two main creeks. The Broken Kettle which cuts thru 3 sections in the Southeast corner of the township. While not located in Westfield Township, it is near enough to be included in the Westfield area. This tree was located in Section 31, Sioux Township on the Birkley farm. It was located in the timber along the Big Sioux River and measured in circumference 29 feet 1 inch at one and one-half feet above the ground. At 5 feet it measured 24 feet 3 inches. This was a single tree, somewhere around 100 feet high. About 10 years ago the timber surrounding it was cut and the big tree stood out all alone like a lightning rod which it turned out to be. Lightning struck and destroyed the tree and the last time I saw it all that was left was a stump some 15 feet high. It was nearly 10 feet in diameter at one and one-half feet off the ground, at ground level it no doubt exceeded this. An amazing site found the early pioneer as he crossed the Mississippi river and headed west. Coming from a mostly forested land he encountered a vertable sea of grass, which ran from 1 foot to over 7 feet in sloughs, with trees only mainly on the rivers and larger creeks. What he was getting into was some 250 species of grass competing on the prairie at the time of settlement. Six of the most important being Big Blue Stem-6ft., Little Blue Stem-1 to 3 ft., Blue Grama-1 to 1.5ft., Side Oats Grama-2 to 3 ft., Buffalo Grass-4 to 6 inches and Needle & Thread- 1 to 4 ft.
With such an abundance of grass, the settlers soon learned to make use of it. As timber was scarce or non-existent, he used its sod to build a sod house. Hay cut from the grass was used for roofing, feed and fuel. Grass had to be cut or grazed down so it could be plowed under and crops planted. It afforded little or no protection from blizzards and was a constant threat from fire. It also slowed rain fun off so that creeks had little or no channel and the bottom grounds were swampy. When strips were plowed for fire breaks the fire would sometimes go under ground and burn under and would emerge on the other side to continue burning. Fences were built out of sod, but did not prove too successful as hogs and cattle with horns would tear them down. Paths were cut thru the grass so children could walk to school. It was claimed that it took from one and one-half to two and one-half acres of sod to build a sod house depending on size. Incidently, corn is a grass. Westfield and the township were well supplied with schools. There were 8 country grade schools plus the school in the town of Westfield. The country schools were: Tucker School, Port School, Breezy Hill School, May School, Happy Hollow School, Stawart School, Odgen School & Toben School. Schools in Sioux Township were: Minors School, Ridge School No. 1, Ridge School No. 2, Lonesome Hollow School, Hunter School. Sunnyside High School was established in 1910. It was the first Township High School in the United States. Hunter reportedly taught a school in a covered wagon that was moved up and down the area of Highway 12 in Sioux Township. As a first settlement in our area, Westfield has a rich and varied history. This small collection of historical facts cannot cover all that has happened in its colorful past. Memories grow dim, people move away, others who have been a part of Westfield's history have died, but certain things remain in man's memory and of some of these I'd like to comment. Things not mentioned in our above presentation range from; The Ghost Town of Texas, SD, the location of the Ponca ferry across the Missouri, the largest cottonwood tree in SD, River boat travel on the Big Sioux, the numerous ferries across that river, the grave of the unkown person dug out while excavating a basement for the Hunter home, abandoned bridges across the Sioux, Fort Brule built in 1862 and abandoned in 1868 and finally dismantled in 1873, groves of settlers throughout the territory, pioneer cemeteries, Indian villages, channeling of creeks, the bank robbery at Westfield, Dr. Brunner who had an office in Westfield some 4 years. The grasshopper crosses at Elk Point, the flood of the 80's, the cattle corrals in Sioux township, Mr. Jordan and son who froze to death during a sudden blizzard in 1872 while getting a load of wood from the Broken Kettle, the loneliness of women on the prairie, the way and conditions under which they lived, to the eternal sea of grass which they encounterered.